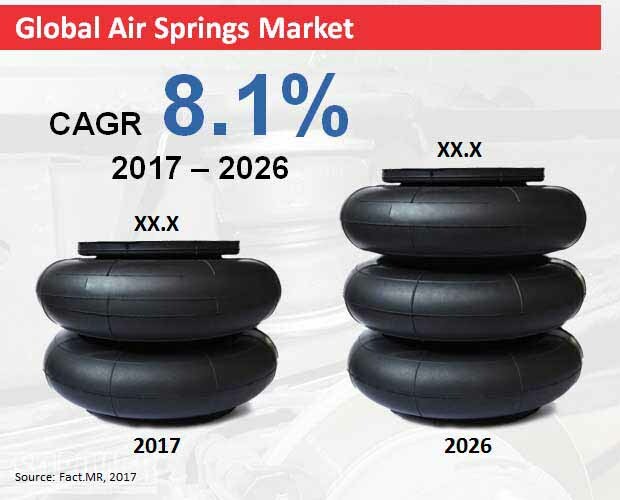 According to the latest market report published by Fact.MR, growing penetration of air springs in luxury passenger vehicles continues to open new growth opportunities for manufacturers. Traditionally limited to heavy commercial vehicles, end-user preference for comfort, glide ride, and suspension adjustment are impacting where the revenue is going in the air springs landscape. Stakeholders in the air springs market must consider the evolutions in this marketplace if they are to rapidly adapt to the new status quo. The air springs market remains fragmentally consolidated, with a large number of America, Chinese, and Indian suppliers/distributors vying for increasing their market penetration and share. A majority of market participants covered in the market have a sizeable presence in APEJ and North America – two key air springs markets globally. Sensing the untapped opportunities in this marketplace, leading manufacturers, including BWI Group, Continental AG, Dunloop Systems and Components, Firestone Industrial LLC, Hendrickson LLC, Mando Corporation, Tata AutoComp Systems, ThyssenKrupp AG, VB AirSuspension, and Wabco Holdings Inc. are focusing on reducing weight and mitigating flex cracking as key focus areas. “Although air springs offer a better ride quality than steel and coil springs, vulnerability to wear and tear, and high maintenance costs continue to impede widespread adoption. Manufacturers who are able to scale up without compromising on quality will have a better shot at market consolidation. Whereas luxury car manufacturers equip air springs as an additional feature, these are steadily gaining traction as standard features in heavy vehicles,” says lead automotive analyst at Fact.MR. According to the analysis carried out by Fact.MR’s automotive research team, high upfront costs and relatively lower lifecycles remain the key barriers to widespread adoption of air springs for end-users. Although the analysts have a bullish long-term outlook, the mantra for success is to mitigate high OEM upfront costs when compared to the aftermarket. Sales of air springs are evenly spread out in both OEM and aftermarket channels, however the former accounted for a higher volume and lower revenue share in 2017. The prevailing scenario in the sales channel is likely to be transformed during the assessment period on account of competitive offerings by aftermarket players. By 2026, aftermarket is likely to reign supreme – both in terms of value and volume. A direct correlation of vehicle production, sales, vehicle parc and demand for air spring is evident. It’s apparent that the Asian economies are leading in terms of vehicle production as well sales, thus equating to preeminence in the global air springs market during the assessment period 2017-2026, according to a new business intelligence study by Fact.MR. Manufacturers must prioritize ASEAN and GCC in their long-term strategic plans to consolidate their position.